What would you do? 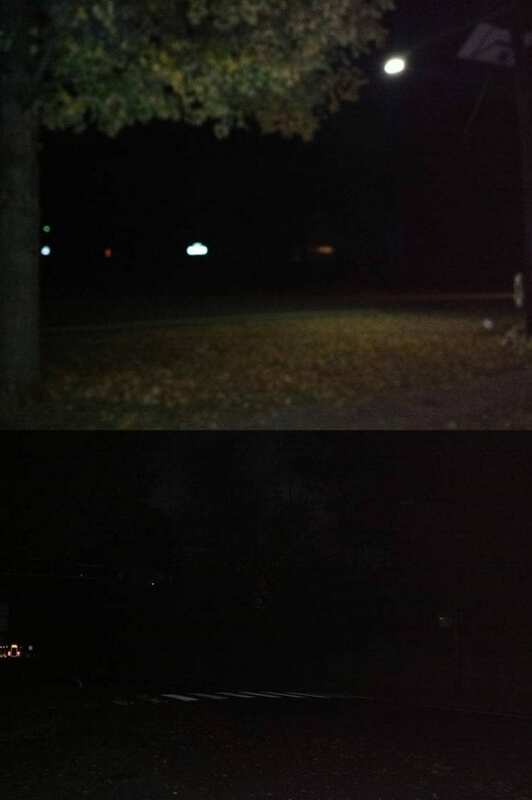 You’re walking at night, from the station to home north of Clarksville – up Scott Ave, through school grounds and the parking lot to the intersection of Clarksville and Hawk Drive. There’s no marked crosswalk, but there is a streetlight. Or, you could go to the painted crosswalk at the opposite edge of school grounds, but there is no street light and no way to manually activate the blinking crosswalk lights that are set on a timer for the students. Also, you’d then have to walk back to Hawk Drive to continue home. What would you do? Cross under the street light without a painted crosswalk or at the painted crosswalk without light? See the picture for an approximation of the differences. Please join us at the Twp Council meeting tonight, Monday November 24, 2014, to ask for an improved painted crossing with a streetlight, pedestrian-activated warning lights and turning on the existing speed display signs at all times, not just during school times. The WWBPA has long been concerned about safety along Clarksville Rd, especially after a pedestrian was seriously injured while walking his dog at the intersection of North Post Road, near the municipal complex. Mercer County’s proposed changes (pictured) partly address and partly heighten these concerns, and should be remedied to make all legs of the intersection safer. 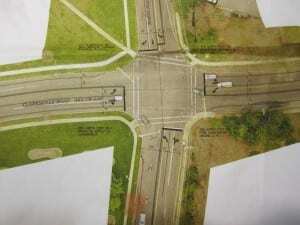 I am writing regarding the upcoming ordinance on the intersection of Clarksville and North Post Roads in West Windsor. As a citizen living very close to this intersection I observe the daily interactions of vehicles, pedestrians and bicycles. As a trustee of The West Windsor Pedestrian and Bicycle Alliance I am concerned with all aspects of safe streets for pedestrians and bicyclists and want the County as well as the Township to remain committed to Complete Streets planning for safe bicycle routes everywhere. The plans for North Post Road are very troubling. Heading south towards Conover, unlike all the other intersection approaches, there are three lanes of vehicle traffic instead of two. 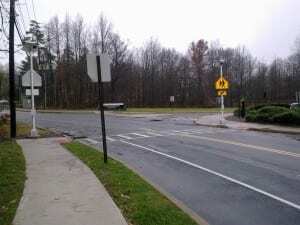 My concern is safety for children and adults crossing this portion of the intersection heading to the Mercer County Library, Municipal Building, Senior Center and Post Office. This crosswalk is heavily used by pedestrians and the increase of vehicle lanes to four across is extremely unsafe for pedestrians, and there is no safe lane for bikes. The second area of concern is the north side of the intersection on North Post Road. The plan shows a 17 foot lane with no provision for a separate bicycle lane, or even a shoulder. There is more than enough room for a vehicle lane as well as a bicycle lane, and this heavily used part of our town needs to have that bicycle lane marked. North Post Road is a popular route to and from the Municipal Complex and County Library and to and from the train station as well as the very popular Farmers Market. The West Windsor Bicycle and Pedestrian Alliance sent a letter in September 2012, supporting changes to this intersection as described in the 2007 report from the Delaware Valley Regional Planning Commission (“Taming Traffic” p.38; diagram p.37). We strongly request you follow through with improving the safety here by following that plan (which does not include any separate right turn only lane). 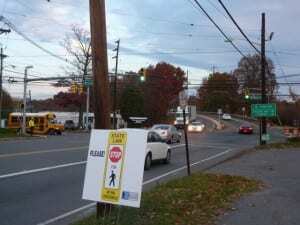 Clarksville Road divides our community in two if traffic taming measures are not implemented. We need safe complete streets especially around our schools and libraries. Unfortunately, I will be out of town for the March 28th meeting or would be there for the public hearing. 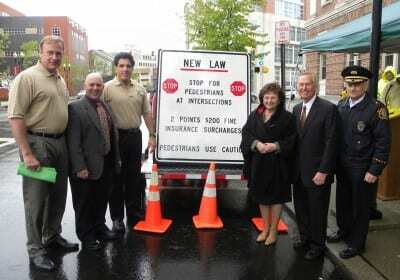 I am asking for you to approve an ordinance with the safety of pedestrians in mind. A four lane road is not a safe road to cross. Thank you in advance for your consideration in this matter. Please contact our officials with your support for making the Clarksville and North Post intersection safer for everyone – motorists, bicyclists and pedestrians. 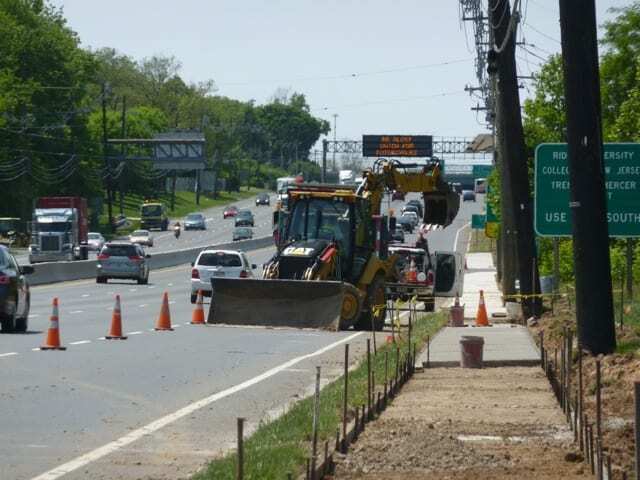 Sidewalks are being installed along Route 1 between Nassau Park (home to Target, Wegman’s and other stores) and Windsor Green (Whole Foods and others), connecting Nassau Park to Canal Pointe and the rest of West Windsor for pedestrians (and bicyclists, we’d wager). The WWBPA wasn’t involved with this project, but the worn path through the grass is evidence that plenty of people were walking this route even without a sidewalk. We also heard several compliments about it, from both sides of Route 1. Here’s one; thank you, Beth Zeitler! One of the great things about living in Princeton is that I can get around on my bike or by walking in addition to using my car. It’s easy to get around the Boro on a bike or on foot, and even to get across Route 1 to Plainsboro to run errands, but often I’d like to head south along Route 1, including to the shopping centers off Meadow Road and Nassau Park Boulevard. I know a lot of other folks do the same, for shopping, dining and entertainment as well as for work. The D&R Canal trail can be used to get to the shopping centers, however because it is removed from the street, it is difficult to visit multiple locations, and hard to use at night or in poor weather conditions. I’m glad they are putting a sidewalk between the shopping centers along Route 1 to make the trip easier and more convenient for folks like me who’d rather get out of the car and use a bike or my feet to run my errands. I’m even happier for the people who will now have a safer commute to work, especially folks who are traveling on bikes out of necessity rather than choice. Infrastructure improvements like this help keep our community moving forward. 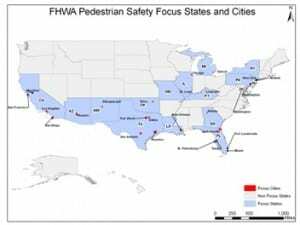 How can these proven safety features help West Windsor? The WWBPA recommends medians and/or pedestrian crossing islands for the new CR 571 design, along with a lower design speed and other measures, like a Pedestrian Hybrid Beacon (HAWK signal) at Sherbrooke Drive and 571. A Rapid Flash Beacon, another type of pedestrian-activated signal, is planned for Sherbrooke and 571 – we hope it will greatly improve the safety of that crossing. Examples are at the trail crossing on South Mill and near the train station at Scott and Wallace. Studies of the Rapid Flash Beacon are promising, but of the 22 roadways in one study, only 1 had a posted speed limit as high as CR571’s 40mph, and only 2 had about the same volume (17K-18K average daily traffic), and only 1 had more volume. So we’ll hope for the best. A Road Diet is when the road is reconfigured from 4 lanes down to 3, one travel lane in each direction and a center turn lane, plus bike lanes on each side. The WWBPA has long recommended road diets for Canal Pointe Boulevard and Alexander Road between Rt 1 and Vaughn Drive, and believes the treatment would be appropriate for Roszel Road and Carnegie Center Drive as well. Why is the WWBPA for road diets in these areas but recommends medians and/or pedestrian crossing refuges for CR 571? The difference is in the number and density of driveways – our Rt 571 downtown area has too many compared to office park settings like Canal Pointe and Carnegie Center. A new rapid flashing beacon was installed recently at the new crossing between Schlumberger and the Princeton Junction train station. The crossing, which is only accessible via a new sidewalk connecting to Route 571, flashes yellow strobes when a pedestrian presses the crossing button. Thanks to the township for including this crossing and sidewalk in the extensive set of new sidewalks installed over the past few months, with funding from a Safe Routes to Transit grant. These pedestrian-activated beacons have been very successful in getting cars to stop for crossing pedestrians in studies, and have a significant cost advantage over other treatments, since they are solar-powered. 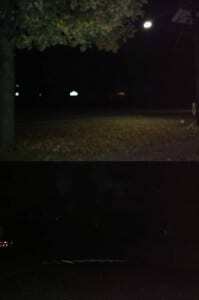 A similar beacon was installed at the Trolley Line Trail crossing of South Mill Road. Since it’s new, it remains to be seen if commuters will cross at this location once they discover it. Most have been crossing at or east of the Schlumberger driveway across from the Amtrak driveway and then walking through the station parking lot, which is more direct. When I walked it, one commuter was doing that while another pedestrian who was walking her dog used the crossing with the flashing beacon. We have lots of copies of this government poster that we think makes a strong case for walkers, joggers and bicyclists to wear reflective material at night. We’ve put up a few in town and are displaying it at the farmers’ market … but where else should there be one? Help us get them up by asking your church, synagogue, sports facility, employer, etc if one can go up and we’ll make sure we get it to you to bring in. Anywhere we can get out the safety message is a good l\ocation. We’d like to see them in places other than West Windsor too. The poster is on the large size — 20″ across by 24″ tall. It’s no longer light when many of us head off or come home from work, or go jogging or walking, and it will soon be darker for many more of us. 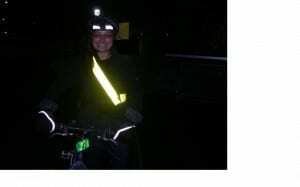 The West Windsor Bicycle and Pedestrian Alliance strongly urges pedestrians, joggers and bicyclists to be bright at night. The dark coats and jackets most of us favor make it hard for motorists to see us; the Federal Highway Administration says a driver will first see someone wearing blue 55 feet away and someone in white from 180 feet – but won’t be able to stop in time for either if he’s going 40 mph. 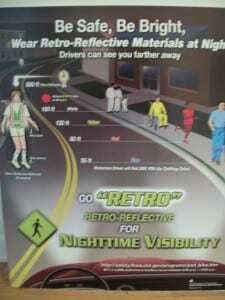 Even when walking in our neighborhoods, where traffic is slower, being visible helps everyone stay safe. The WWBPA will demonstrate and sell a wide range of items at the West Windsor Farmers’ Market on Sat., Oct. 1 that will make you more visible: vests, belts and briefcase straps with reflective materials, small lights to hang off the end of purses and backpacks and of course lights and reflective tape for bikes. Come see us between 9 a.m. and 1 p.m. in the Vaughn Drive commuter parking lot off Alexander Road. You can’t be too visible. 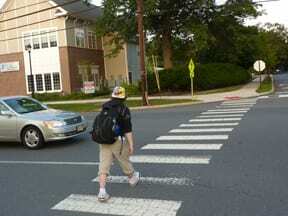 Responding to concerns voiced by the Township Council, the West Windsor police are enforcing the new state law which protects pedestrians by making it mandatory for motorists to stop for pedestrians in crosswalks. They also want pedestrians to stay in the crosswalks. Erring motorists are receiving tickets and points. Police are also citing pedestrians who do not stay in the crosswalk (where one is available) when crossing a road, especially pedestrians who cross two streets at once in a diagonal line. Everyone–motorists, bicyclists and pedestrians–treat each other with courtesy and enhance road safety for all! Comments Off on Watch the Crosswalks! Middlesex County has created a traveling sign aimed at informing motorists about the law that took effect last year and requires motorists to stop — not just yield — for pedestrians in crosswalks. The sign also spells out the consequences of those caught not doing so: two points plus a $200 fine. The sign can be requested by any Middlesex municipality. So where would be a good spot in Plainsboro? “Pick a street, ANY street” is what we were told via Facebook. What do you think?